Between 1996 and 2004 Switzerland and its main trading partner and FX proxy Germany saw slower growth compared to other European countries. German GNP fell from 254% of the European average in 1990 to 129% in 20021. One reason were the massive transfers to the former communist Eastern part with the German reunification. Over-investment and Keynesian measures in Eastern Germany led to a tax-induced housing bubble that burst some years later. These over-investments artificially sustained Western German salaries. Finally many workers left suffering Eastern Germany. This rising labor force increased German unemployment to 9.4% in 2004, higher than in many European countries; whereas, before 1990 Germany had far lower unemployment. Higher labour supply also put pressure on Western German salaries. Real wages in Western Germany fell by 4% between 1991 and 2011. 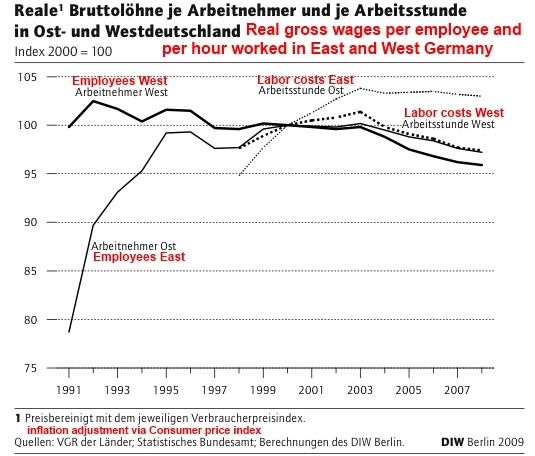 Labour costs in Eastern Germany rose significantly till 2000 and reduced the competitiveness of Eastern German companies. While Eastern Germans wanted to cover their consumption gap, the traditionally strong German current account surplus weakened between 1990 and 2000. This again strengthened the U.S. trade balance and the dollar. The smaller trade deficit thanks to higher demand from Eastern Germany and other former communist countries was one contributor to the American overspending and the dot com bubble until the year 2000. After the year 2001, with the bust of the German new economy, a de-leveraging took place. German companies and individuals tried to reduce debt, a balance sheet recession happened. Due to the dependency on Germany and the de-leveraging after the Swiss real estate crisis, Switzerland experienced slow growth as well. 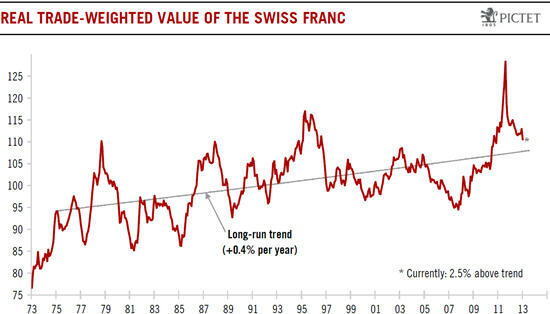 After the strength of the 1991 boom and high rate speculation in 1995, the franc remained close to the linear trend of the long-time REER. Between 1996 and 2004 the franc was mostly correctly valued. With strong demand from Germany, Swiss salaries and inflation rose quickly in the early 1990s and created higher inflation in Switzerland. Swiss inflation topped at 6.6% in 1991. For us, this rapid rise in wages made Switzerland incompetitive. Aymo Brunetti and Boris Zürcher of the State Secretariat for Economic Affairs (SECO)2 saw additional reasons for the weak Swiss growth: they claimed that labor productivity was not sufficient. Reasons were the high Swiss employment rate of 82% and that poorly qualified European personnel was still able to find a job in Switzerland, but often not in their home country. Their analysis was based on a simple output per labor input (Y/L) definition. We think that they missed to take into account the previous rise in wages and the relationship between house prices and consumption. 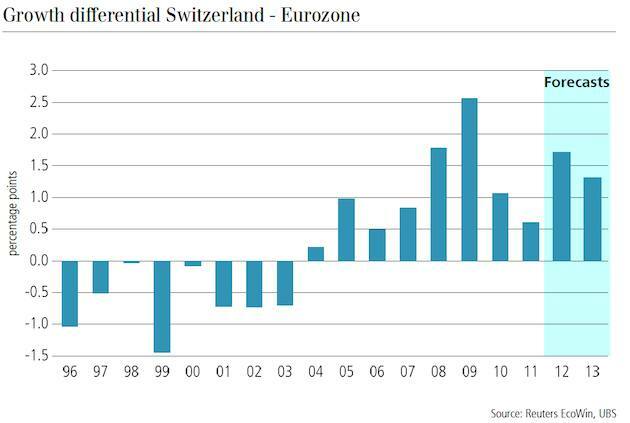 During that period, falling home prices and high interest rates to fight inflation put a drag on the Swiss economy. Low consumption increases implied lower GDP growth, but rising trade surpluses and stronger Gross national income. In 1999 the Swiss money supply targets were replaced by the slightly modified inflation-targeting “Concept 2000”3 that aimed to achieve long-term price-stability within a range between 0% and 2% for the consumer price inflation (CPI).